Strawberries are one of the potential allergens hence its recommended to introduce strawberry for babies during 10-12 months age. But recent studies are suggesting to introduce allergen foods sooner, hence consult with your doctor about the same. When you introduce, u can offer mashed strawberries or cut tiny pieces of strawberries as finger food if your baby can handle the same. The tiny seeds of the strawberries is completely edible and hence its not necessary to remove the seeds, but buying organic strawberries is highly recommended. 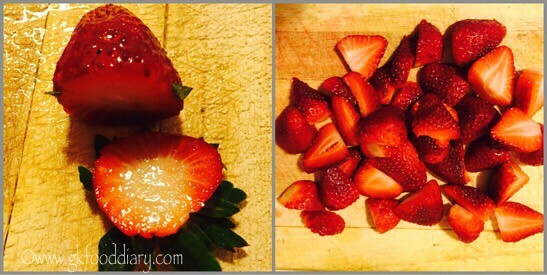 Look for a strawberry fruit with the skin not bruised, no visible cuts and leaves with nice green color. 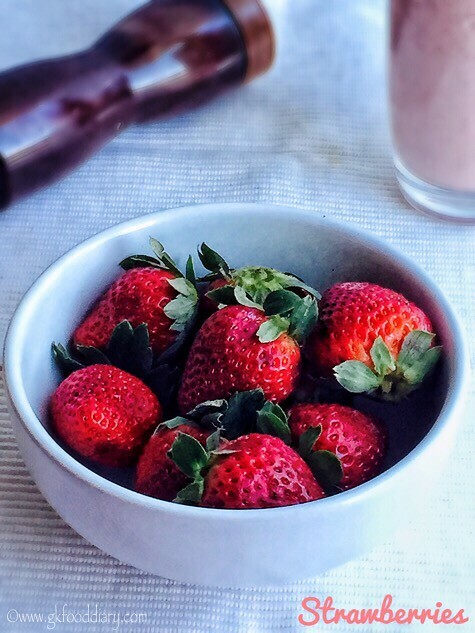 Choose ripe and organic strawberries for best results. 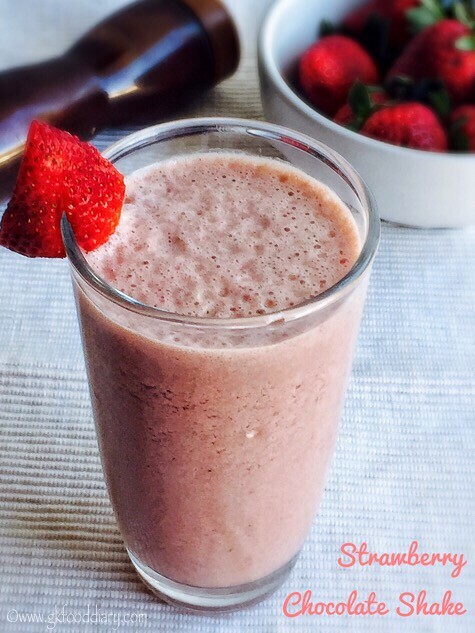 Here is how to make strawberry milkshake for toddlers and kids with homemade chocolate syrup. Keep all the ingredients ready. Wash the strawberries in running water thoroughly. Place it on a cutting board and slice off both the end of the fruit. Then slice the fruit vertically or horizontally. 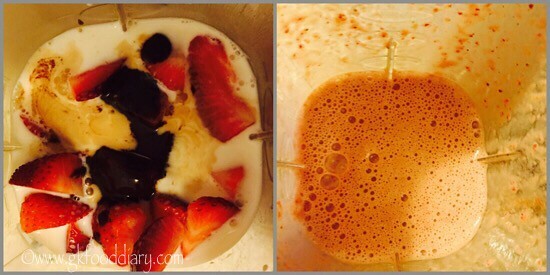 Then take the chopped strawberry pieces, milk and homemade chocolate syrup in a juicer/blender. Blend everything till smooth. 1. Keep all the ingredients ready. Wash the strawberries in running water thoroughly. 2. Place it on a cutting board and slice off both the end of the fruit. Then slice the fruit vertically or horizontally. 3. Then take the chopped strawberry pieces, milk and homemade chocolate syrup in a juicer/blender. Blend everything till smooth. 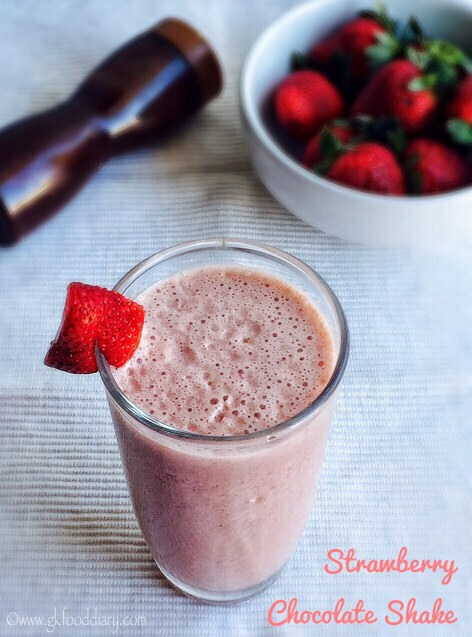 The tasty strawberry milkshake is ready. Serve chilled !!! 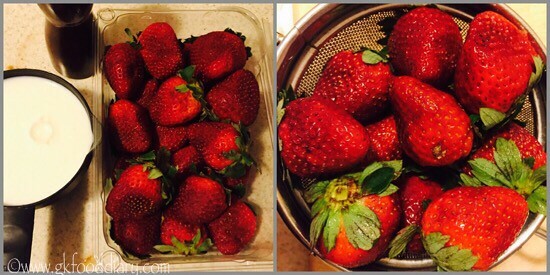 Choose ripe and organic strawberries for best results. Adjust the amount of chocolate syrup according to strawberries sweetness. You can add bananas or mangoes to this milkshake. I used homemade chocolate syrup. You could use store bought ones. You can make this without chocolate syrup too. Instead add honey or dates syrup. 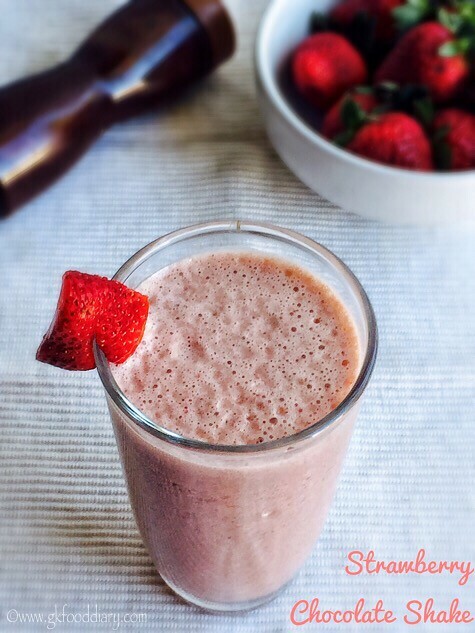 Make sure to introduce strawberries and cows milk separate before you try this strawberry milkshake.